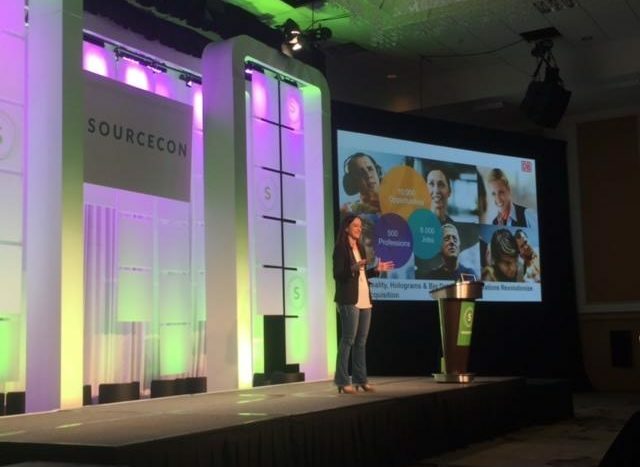 This past week I had the opportunity to attend the Spring SourceCon event in Anaheim, CA. It was chock full of ideas, information, and enthusiasm. One of the highlights of the trip for me was a presentation by Kerstin Wagner. Wagner is the Head of Talent Acquisition for Deutsche Bahn. The theme of her presentation was “How Innovations Revolutionize Talent Acquisition.” Thirty minutes into her presentation I took to Twitter and announced to the world that I had a new hero. Presentations can resonate with you for a variety of reasons, but for me, it was the attitude or philosophy that Wagner and her team have taken in their quest to become a top employer. I found it to be very progressive and a great example of how innovation, branding, marketing, and technology can all come together and be an integral part of an overall talent acquisition strategy. While I could never do this presentation justice by simply putting it into words, I wanted to share some of my key takeaways. I know that this is a hot topic for many of us and it’s something that I’ve written about previously. Wagner and her team have taken it as far as to identify 11 core competencies that make up a successful recruiter. The most intriguing of these competencies they label as a trendscout. A trendscout is someone who lives and represents the innovative image of the company. This outlook was refreshing to me. I was impressed because not only does the Deutsche Bahn team identify some of the core traits that are required of a modern day recruiter, but they recognize innovation and innovative thought as a core competency that they look for when building a talent acquisition team. From the onset, it’s apparent that innovation is not only valued but is considered a necessity. Laying this type of foundation can only help when trying to build a creative culture. As a leader within a talent acquisition function, I can tell you that while I embrace the idea of innovation, it can sometimes be hard to figure out how to truly implement it within my team. Telling someone to “be creative” sounds good but to do it without cultivating an environment that promotes new concepts is an exercise in futility. Wagner mentioned several ways in which they encourage innovative behavior, and I made sure to take note. The approach that she outlined highlighted some things including market and performance analysis screening other companies to see how they utilize technology, and constantly challenging processes. One of my favorite approaches that were mentioned was to continuously monitor technology and technological advances regardless of their application. Then, brainstorm and derive use cases from utilizing these technologies in talent acquisition. The second approach that struck a chord with me was the formulation of digital and social think tanks. Every four weeks a group of people who have volunteered and show a passion for innovation meet and discuss new ideas and philosophies. These individuals come from various sectors of the business, and they are encouraged to brainstorm in a consequence-free environment. I loved this idea. Organizing a group of people who are interested in challenging the status quo and giving them the opportunity to express themselves in a space where they can feel comfortable, I think it hits the mark. These are great ways to promote creative thinking, but it can’t stop there. Applause rang out at SourceCon when Wagner made the following statement “How can I ask my team to be trendscouts if I’m not a trendscout myself?” From my perspective, the message here is very clear. Your leadership must embrace change and new ideas. It’s impossible to foster a genuinely creative environment if the members of your team are met with nothing but resistance from the people they look to as an example. Wagner went on to mention some other things that are important for leaders to do. Leaders must recruit employees with an innovative mindset. They must encourage collaboration. Again, talking about this is not sufficient. Facilitating meetings that promote innovative thinking, promoting and recognizing new ideas, and letting the employees take control of their creative process is key. If you want candidates to view your company as a cutting-edge company that is innovative and embraces new ideas, it’s not in your best interest to be a technophobe. Sometimes new technology can be intimidating and hard to trust. Ask my parents and their VCR from 1994. When utilized properly and taken advantage of, new technology can be a huge advantage for you. This is especially true when you can tap into a technology before your competitors do. It makes you stand out. It differentiates you from the crowd. I thought that some of the things they were doing at Deutsche Bahn were cool. I know that’s an oversimplification but trust me when I tell you that as I watched the presentation, I just kept thinking “that is cool.” I will give you some examples. Let’s say that you want a potential candidate to understand what a day in the life looks like when assessing a new job possibility. Why not tap into new virtual reality technology and provide them with a look into what they will be doing? This is something that they are doing, and I love the idea. You’re telling the candidate that not only do we talk the talk, but we also walk the walk. Another thing that was highlighted came as a result of the use cases and the think tank that I mentioned earlier. After observing the use of holograms from another industry, Deutsche Bahn had discussed the idea in one of their think tanks. From there, they devised a way to apply it to talent acquisition and developed a prototype. Now, with a smartphone as well as an inexpensive and easily accessible prism, candidates can receive a holographic transported message. After seeing this technology in action, I was impressed by the impact that it could have and how it could affect your employment brand.